While Hannah was playing in our bedroom this morning, (as I was trying to wake up) she suddenly told me, "Mommy I am not a stealer." I thought to myself, "Good! But why are you telling me this?" She went on, "I do not steal things...." I told her "That's a good girl." 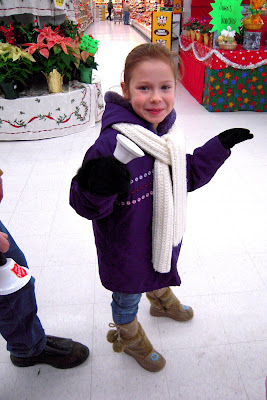 and then she continued on, "...Like my daddy!" 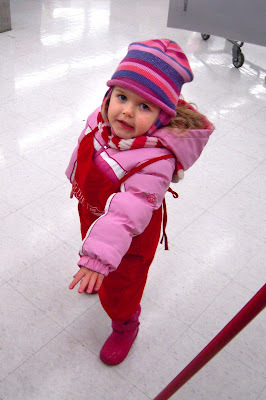 While I resisted breaking out into laughter, I said, "Daddy is a stealer?" "Yes" she said. I said "What does he steal?" "OH, he steals lots of things.... like my worms!" (She is referring to the gummy worms given to her and big sister by Grandma Carol.) What a laugh I had then. So, here's a warning out to Daddy... you better stop stealing the worms or the Hannah police will be putting you in the slammer! My sister tagged me, which apparently means that I have to post the 6th picture in the 6th folder of all my photo files. It didn't exactly work that way for me... as many of you know I take a lot of pictures, so it was something like, 6th folder, 6th folder, then 6th photo. 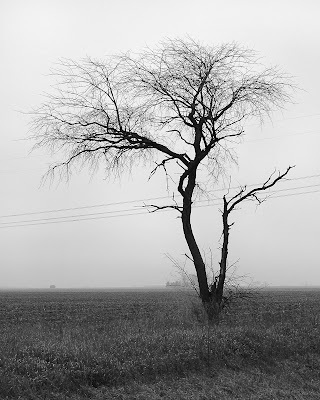 This is the tree that I drove by many times on the gravel road to our house in Iowa. I always loved this tree, it was so moving to me and like an old friend saying "Hello" each time I drove by. I miss the tree, and sometimes the amazing amount of space we had in that old Victorian, but not the mold and stress and constant projects. I have new tree friends here where we live now... I am greeted by three enormous pine trees out my kitchen window each morning. I am glad that God decided to create trees. There are so many kinds, and variety's all displaying His glory. I hope that you have a special tree near you to enjoy as well. Oh yes, and I now tag Ria, Dana, Joanna and Amy - dear friends who I know take pictures too! 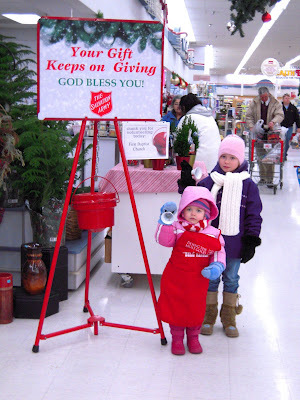 For the past two years we have signed up the girls for Bell Ringing at the local grocery store to try to teach them about "working for the Lord". 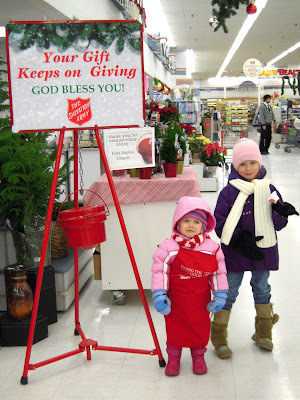 Mommy is excited about it, since I know how cute they look while ringing bells... who would not want to drop a few coins in the bucket with these sweet faces looking you in the eye as you leave the store? Although, they do not think it is as fun as Mommy does. It is a whole lot of fun for about the first five minutes and then the rest of the hour seems as an eternity for them. No matter how much I tell them "Jesus is so pleased with your service...", it does not seem to inspire them:) Hopefully someday they will look back and thank me... Here they are after the fun has worn off... And then they realized toward the end of the hour that they could sing and dance... so that brightened things up a bit!